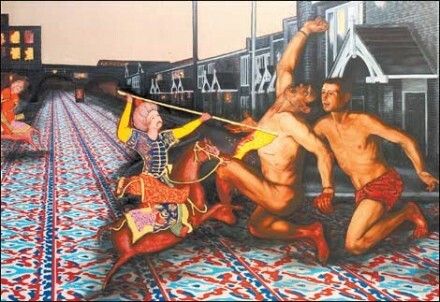 For the first time in France, Tri Postal art space presents 60 works by 28 artists from the collection of London’s Saatchi Gallery, showcasing contemporary Chinese, South Asian, and Middle Eastern artists with works in all media. Dealer Charles Saatchi has been a pioneer in the acquisition of contemporary Asian Art, aptly naming the exhibition after the ancient trade route between Europe and Asia. 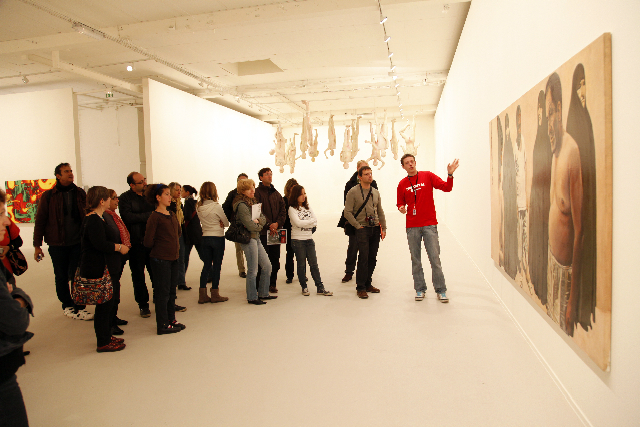 Tri Postal is located in Lille, a one hour train ride from Paris. 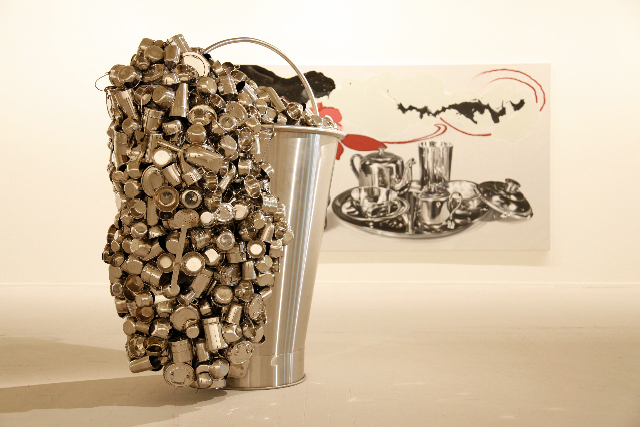 The exhibition features artists such as Qui Jie, Subodh Gupta, and Schandra Singh. One of the most visually arresting pieces, Zhang Huan’s Ash Head No. 1, was created by collecting burnt incense over a steel frame to form a monolithic half-face. Interested in the relationship between the spiritual and the corporal, Huan’s sculptures take on the look of religious icons, while his performances interrogate the significance of ritual. This act of repeatedly burning incense sticks refers back to the commentary on religious ritual inherent in the piece, the artist’s practice remaining just as significant as the finished art object. 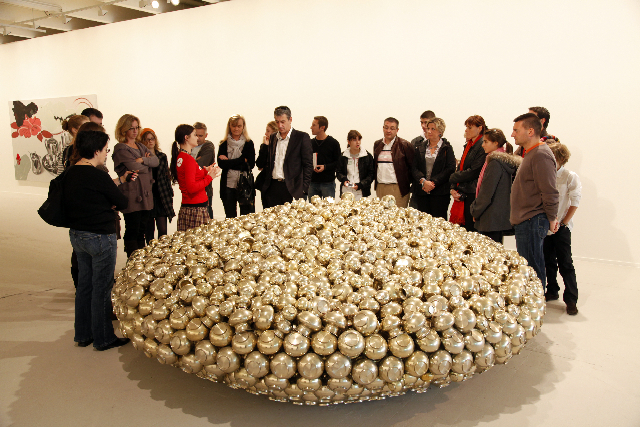 Another piece of note is Indian artist Subodh Gupta’s U.F.O. 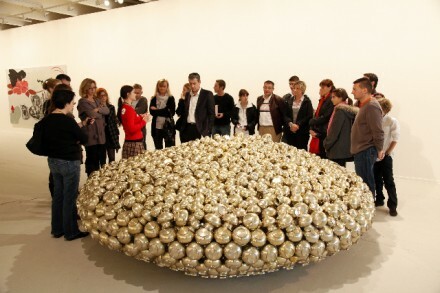 Gupta is perhaps most famous for his incorporation of everyday objects of Indian life into his sculptures. These relics of the everyday do not entirely lose their significance once they become material for an art object. Rather, through his assemblages Gupta attempts to reconcile these traditional, sometimes arcane tools with the new economic growth of his country, and with that a new found materialism. 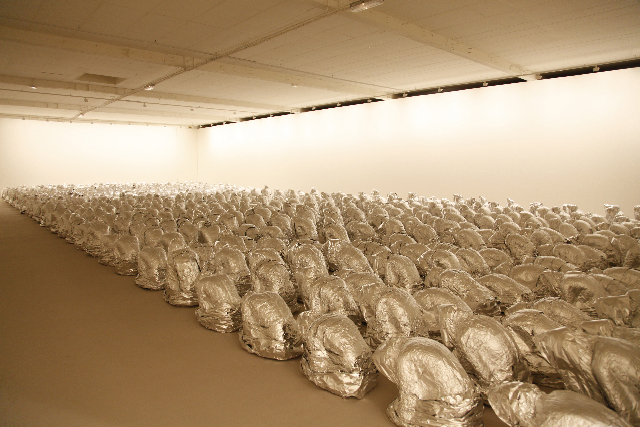 By titling the work U.F.O, Gupta pokes fun at his status as a foreigner and also emphasizes the foreignness of his materials. 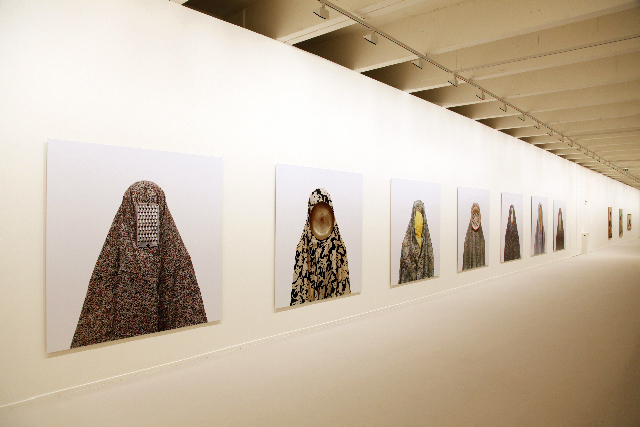 La Route de la Soie examines some recurring themes among eastern cultures: the relationship between ancient and modern, the worship of icons, and the emphasis on materiality. 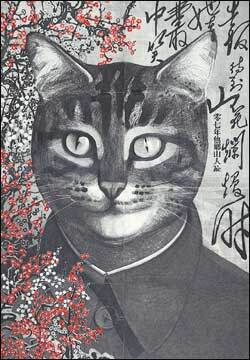 The social relationship between the East and West is also examined, perhaps most whimsically in Qui Jie’s “Portrait of Mao.” The work shares a title with the iconic Warhol silkscreen of Mao, and, with a cat filling in for the Chairman, mockingly hybridizes ancient Chinese calligraphy, 1960s pop art, and the current culture of celebrity. 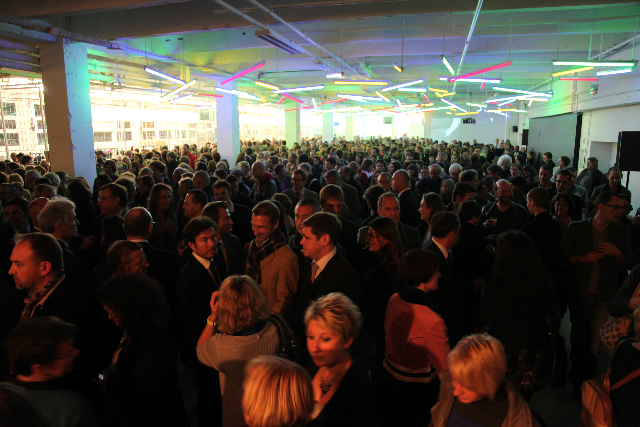 In 2004 Lille was awarded the annual prize of European Capital of Culture. The city hosted hundreds of events and exhibitions in honor of the title, which catalyzed the transformation of the Tri Postal from railway station mail sorting office to ambitious art and music venue. 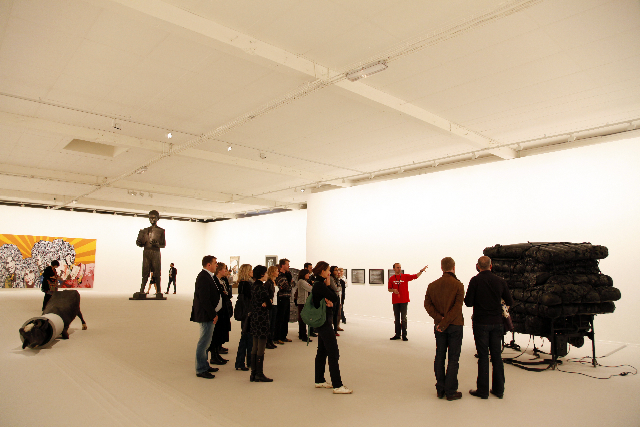 Tri Postal is the first ever contemporary art museum in the city of Lille and it has supported non-western artists since its inception. In 2007, they presented Bombaysers de Lille, an exhibition showcasing the art of India, and Liquid Frontiers in 2009, which presented contemporary Kazakhstani artists. This entry was posted on Saturday, January 8th, 2011 at 3:15 pm	and is filed under Go See. You can follow any responses to this entry through the RSS 2.0 feed. You can leave a response, or trackback from your own site.